Located in Qaryiblar Village, this hotel is 550 yards from the Vilesh River. 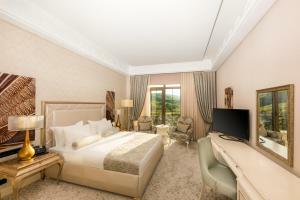 It features a 24-hour reception, spacious garden and air-conditioned rooms with free Wi-Fi. Decorated in classic style, rooms and suites at Vilesh Hotel come with satellite TV and minibar. Private bathrooms are fitted with a shower, bathrobes and slippers. 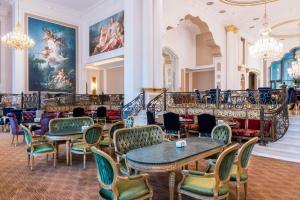 Guests can enjoy European and Azerbaijani cuisine in the on-site restaurant, or have a drink at the bar. Masally Train Station is 15 minutes’ drive from Vilesh Hotel. A shuttle to Lankaran International Airport (24.9 miles) is available on request. Baku city is 155.3 miles away. Located in the picturesque area, Quba Palace Hotel features a spa and wellness centre, indoor and outdoor pools, sauna, hammam and fitness centre. Free parking is available on site. The rooms offer air conditioning, a seating area, fridge and flat-screen TV with satellite channels. The bathrooms provide a hairdryer and bathrobes. Guests can dine in 1 of the 3 on-site restaurants, serving national, international and European cuisine, or use property’s barbecue facilities. There is also a bar in the hotel. Room service and breakfasts in the room are provided upon request. An array of activities can be enjoyed on site or in the surroundings, including tennis, table tennis, golf and mini football. A Bus Station is 5.6 miles from the hotel, and shuttle service is provided at surcharge. 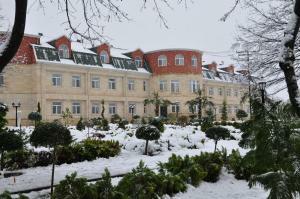 Baku Train Station is 101.9 miles away, and Heydar Aliyev International Airport is 118.7 miles from Quba Palace Hotel .